Product #22019 | SKU WB-CMII | 4.0 (based on 1 rating) Thanks for your rating! 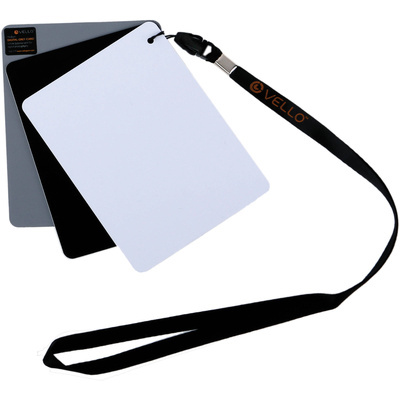 The White Balance Card Set from Vello provides an 18% gray card along with white and black reference cards. With your digital camera, the gray card helps you to determine accurate exposures, the white card achieves the optimal colour balance under any lighting situation, and the black card can be used as a reference point when editing your images in a post-production software. Also, the included lanyard helps to manage your cards while using them.